The National Heritage Board (NHB) is partnering various community partners for this event. Members of the Malaysian-Singapore Vintage Cars Register (MSVCR) would be displaying about 50 vintage cars at the event, to showcase private transportation of yesteryears. 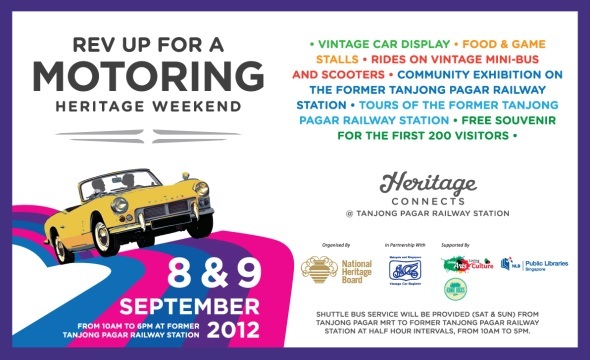 In addition, NHB is partnering various heritage enthusiasts, such as bloggers and train enthusiasts to host a photography exhibition on the Tanjong Pagar Railway Station, highlighting the train and station operations in the past and people’s memories of the place. URA will also be displaying panels from their “Journey of Possibilities” Competition, showcasing winning proposals on the future of the Rail Corridor.